Classicladder is the original work of Marc Le Douarain. The realtime module is loaded much the same as before, but you can specify how many new timers you want with numTimerIec?='number'. Also Classicladder now has 10 each of s32 in and out pins by default . 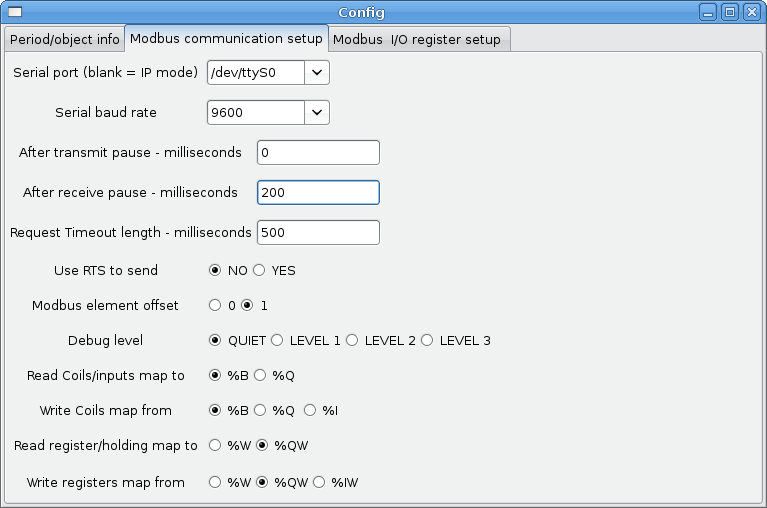 The user module still can be loaded with the --nogui option but also has a option for loading MODBUS info. Now you should use --modmaster instead of --config=filename to signal that you want modbus master initialized. 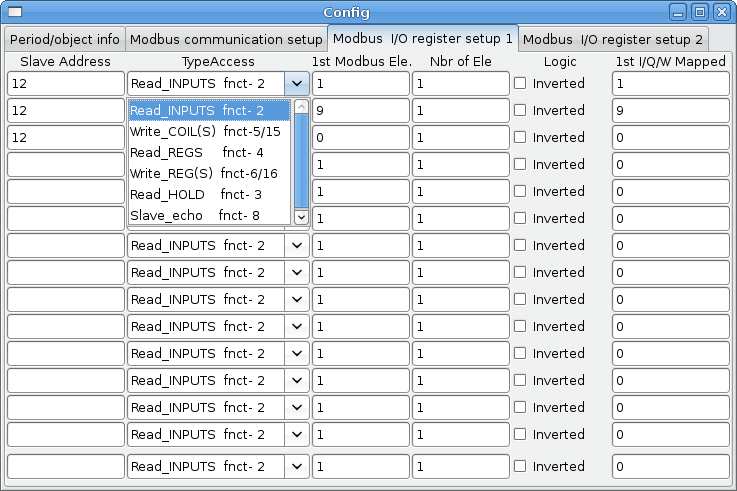 The modbus communications page info is now saved/loaded with everything else in a ladder program. That is the status bar that gives you info about elements of the ladder program that you click on. the vars button is for looking at variables, toggle it to display one, the other, both, then none of the windows. 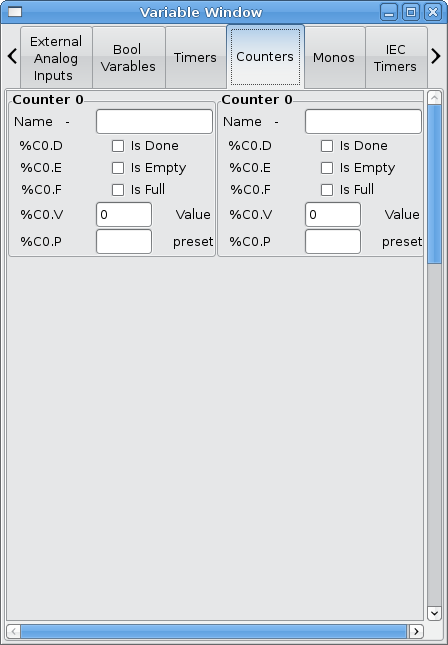 Config is for configuring MODBUS and to display how many elements there are. The rung displayed has a new timer (top) and a sorta old timer (bottom) in it. Marc changed the old timers by adding a control pin to it (C). The way to make it work like the old timers is to connect E and C together. But this would break old programs. 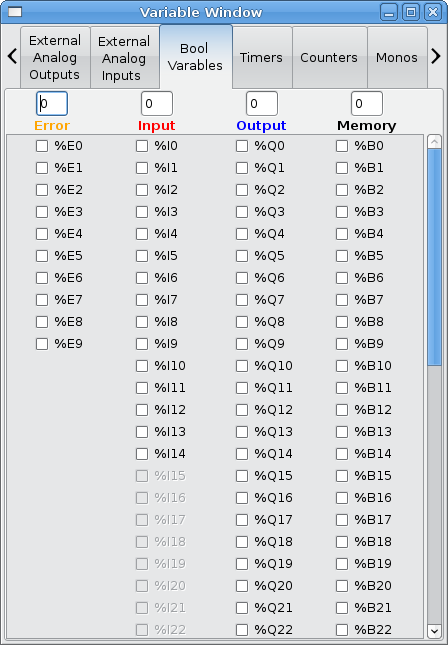 The new timer (called timer_iec) is to replace the old timers and monostables. erase the codes with the editor and save the program. In this version Modbus is enabled. Dave used an embedded controller called Cubloc (model 280 I think) http://cubloc.com/product/01_01.php for a slave device. Modbus is not really suited to Hard real time events such as position control of motors or to control E-stop. 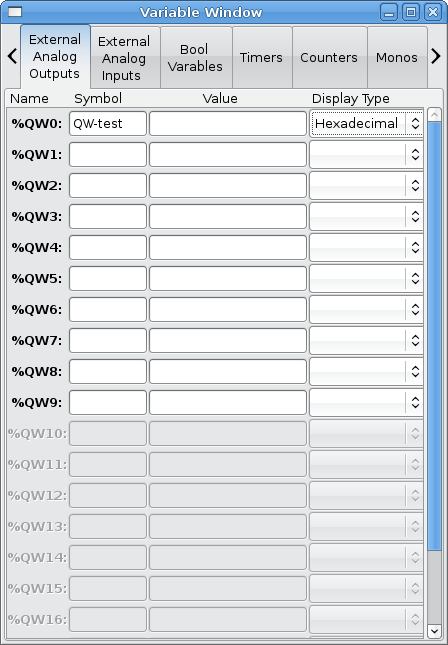 The classicladder GUI must be running for Modbus to be running. Modbus is not fully finished so it does not do all modbus functions. my idea behind this is to get a working modbus solution out there then we can decide how it should be done in the best way. As it stands now classicladder also loads a TCP modbus slave (if you add --modserver on comand line) - I have not tested this nor have I tested the TCP modbus master. I have done some testing with the serial port and had to add some functions to get it to talk to my VFD -but it does work. Modbus function 1,2,3,4,5,6,8,15,16 (read coils,read inputs, read holding registers, read input registers, write single coils, write single register, echo test, write multiple coils, write multiply registers) are currently available. If you do not specify a --modmaster when loading the classicladder user program this (next) page will not be displayed. SERIAL SPEED           -  Should be set to speed the slave is set for - 300, 600, 1200, 2400, 4800, 9600, 19200, 38400, 57600, 115200 are supported. REQUEST TIMEOUT LENGTH -  Length (milliseconds) of time before we decide that the slave didn't answer. DEBUG LEVEL            -  Set this to 0-3 (0 to stop printing debug info besides no-response errors). -  For IP -The slave IP address plus optionally the port number. The serial speed is set to 9600 baud. The first line is set up for 8 input bits starting at the first register number (register 1) so register numbers 1-8 and maps them on to Classicladder's %B variables starting at %B1 ending at %B8. The second line is set for 2 output bits starting at the ninth register number (register 9) so register numbers 9-10 and maps them on to classicladder's %Q variables starting at %Q9 ending at %Q10. It's easy to make an off-by-one error as sometimes the modbus elements are referenced starting at one rather then 0 (actually by the standard that is the way it's supposed to be!) You can use the modbus element offset radio button to help with this. The documents for your modbus slave device will tell you how the registers are set up- there is no standard way. To use the echo function select the echo function and add the slave number you wish to test. You don't need to specify any variables. The number 257 will be sent to the slave number you specified and the slave should send it back. you will need to have classicladder running in a terminal to see the message. Baud rate must be the same for slave and master. Classicladder can only have one baud rate so all the slaves must be set to the same rate. Pause inter frame is the time to pause after receiving an answer. The slaves and theirs I/O can be configured in the config window. 2 exclusive modes are available : ethernet using Modbus/TCP and serial using Modbus/RTU. The slave address is the slave address (Modbus/RTU) or the IP address. the port 9502 will be used per default. See examples: adam-6051 and modbus_rtu_serial. 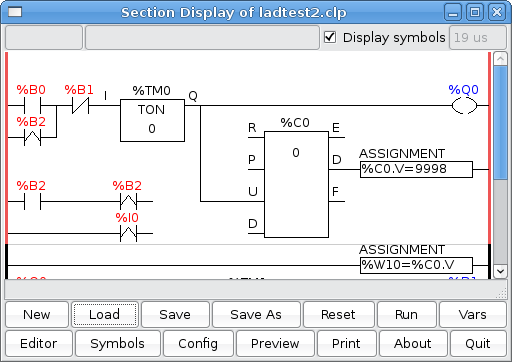 ClassicLadder has a Modbus/TCP server integrated. Default port is 9502, standard 502 requires that the application has been launched with root privileges. List of Modbus functions code supported are: 1, 2, 3, 4, 5, 6, 15 and 16. Modbus bits and words correspondence table is actually not parametric and correspond directly to the %B and %W variables. Such as changing a counter preset, or seeing if the a timer is done running. If the section manager is placed on top of the section display, across the scroll bar and exit is clicked the user program crashes. When using --modmaster you must load the ladder program at the same time or else only TCP will work. 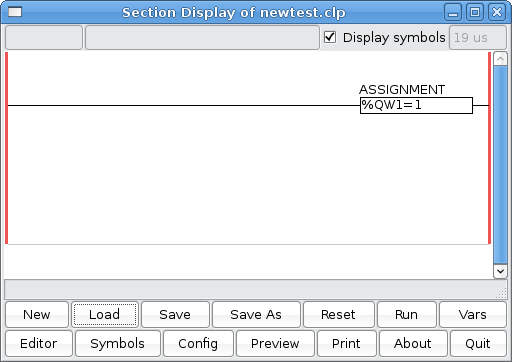 It seems sometimes when saving the modbus port name the data is saved corrupted...the work around is to edit the .clp file by hand. Variables indexed with a variable are now available. Some might call this vectored variables. There are new timer that are IEC compliant. There are three modes - TON, TOF, TP. 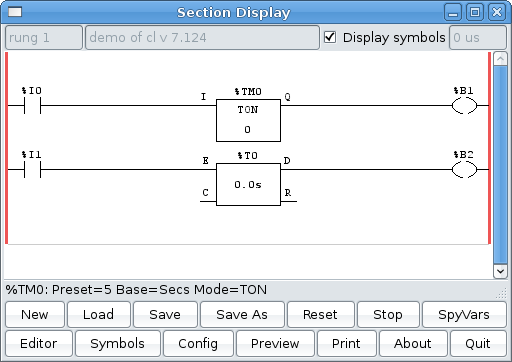 TON when timer input is held true, sets output true after countdown is done and as long as timer input is still true. TOF When timer input is held true, sets output true till the input is false then the timer counts down and sets output false. The time intervals can be set in multiples of 100ms, seconds, or minutes. Classicladder now uses %IW and %QW variables to connect to s32 in and out pins instead of mapping on top of %W variables. The default number is 10 each. Classicladder now can connect to float pins. Classicladder does not yet internally handle floats, so it cuts the floating point off leaving an integer. Allows connections to float pins with out using a conversion component. The default number is 10 each. %E variable are intended for internal error tracking. This file represents the ladder rung above. each group is sorted as so: element type, connection with top, variable type / variable number. 9 stands for horizontal connection, 99 is used block and 60 is assignment block. - The classicladder userspace program should check that the realtime module has loaded enough ladder elements for the program requested. This should be fairly easy as classicladder already saves ladder element numbers with ladder programs. I keep thinking that the userspace program should load the realtime program this would simplify some things-but break configs. - A button that loads a text reader that displays a description of a ladder program would be nice. like a help screen I guess. I like self documenting programs.